This is story for those going through hard times. I won't take all the credit for this. Footsteps the poem gave me the inspired to create it. Dannika's What do you think of heaven and hell inspired me to write it down. Rick watched the men slowly lower the casket into the ground. A lone tear rolled down his cheek as he silently said good-bye to the deceased. The men buried the casked and the funeral ended. Rick turned away from the grave and picked up his drowsy looking daughter. He smilled miserable as she rubed her eyes and fell asleep on his shoulder.He walked to the car and put her inside her carseat. Then got in himself and drove home. When he got home everything seemed out of place. So much was missing, her laughter as he fumbled with their daughter's seatbelt, her angry sigh as he told her, "I forgot my keys again", her smile as he walked through the door. Rick closed his eye and barely managed to hold back tears as he carried his daughter in her room. He tucked her into bed and her eyes opened slowly. "Where's mommy," she said sleepily. "Mommy's not here, " Rick whispered, "Go to bed, honey." "No Mommy tucks me in." "No my mommy loves me! Mommy! Mommy where are you?!" Rick closed his eyes again, "Honey, your mother is...shes....." Rick opened his eyes and saw the his daughter was asleep. "Mommy," the little girl mummured in her sleep, "Mommy i love you"
Rick turned around and left the room. In the doorway he looked back at his daughter. She was sleeping peacfully, so he closed the door. Inside his bed room Rick fell on his knees beside his bed. He layed his head on his covers and prayed. "Why God? We were a good family. We went to church. We helped our neihbors. How could you leave us like this?" His tears were flowing now, and they wouldn't stop. After what seemed like hours of mercyless tourture the pain in his heart lessened and he cried him self to sleep. What Rick saw now was a beach, and going down the beach were two set of foot steps. There was noone there making the footprints, but Rick knew one was him and one was God. The sky flashed and was replaced by fleeting images. Images, that Rick reconized as his childhood. The images and the footstep continued walking their way though Ricks life, narrating all the way to the time of the funeral and Rick crying on his bed. As Rick watched he noticed something. During the most difficult, bleakest times of his life there were only one set of foot steps. Rick cryed out into the sky, "God why? 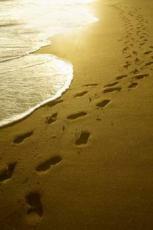 During the hardest times of my life there is only one set of footprints. You desert me when I need you most!" For a few moments everything was silent. Then a voice came from the heavens, a voice stronger than an earthquake yet gentle as the wind swept through the beach. "When you see only one set of foot prints, my preciuos. That is when I caried you. © Copyright 2019 Dragoon. All rights reserved. i think this is great. good job!!!!!!!!!!!!!!!!! Your story was great :) Sad, sweet, deep. Liked it! I like the last line too. Its my favorite. Because its so deep as you said and also true. Aww, that was awesome =^.^= I agree with Alice, the last line was simply profound, perfect. Brilliant work. :) I love the poem too. The poem is so moving by itself, i hope i only increased the emotion! I loved the poem too. XD Cryings good for you! Your story is very emotive and using the last line of the poem as the last line of your story is very clever! We do not see the overall picture that God Sees of our lives; to believe that He has Good Plans for us, even in difficult times, is not always easy! However, despite what people may choose to believe, He IS A Loving Heavenly Father and Knows what is best for us! Keep on exploring your gifting! This page was created in 0.4294 seconds.